Tim Meeker is the younger of the two Meeker sons, who grew up in a Tory family. 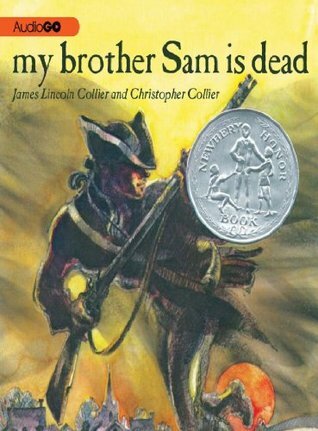 As the American Revolution begins, Tim's older brother, Sam, decides to join up with the Rebels to fight against the British, setting into motion a series of events that ultimately culminates in his death. Tim comes of age during this time, as he is required to take on more and more responsibility as the horrors of war move closer and closer to his own doorstep. This book is interesting mainly because it is does not strictly align itself with the point of view of Americans who favor the Revolution, but focuses instead on a family who is perfectly content to live under British rule. Showing how the war made enemies not just of British rulers, but of British subjects living on would-be American soil, is a powerful way to drive home the ugliness of war, and it will certainly be eye-opening for kids who have been taught about the Revolution only from the Rebel point of view. Equally eye-opening are the ways the Tory characters are forced to suffer the violence of the Rebel troops, even when they are not violent themselves. This book gives a much broader picture of what America was like during the Revolution than many other books of its type. Another selling point for this book is that the characters speak primarily in modern parlance. The language does not sound "old-fashioned" and in particular the way the brothers interact with each other feels very true to what contemporary kids are probably used to with their own siblings. (The realism of these exchanges might also be connected to the fact that the authors are themselves brothers.) While the contemporary language is somewhat jarring, after reading books like The Witch of Blackbird Pond and Blood on the River, it does make for quick and easy reading, and it will help kids engage more readily with the subject matter. Because of the anti-war sentiments, and the Tory point of view, this is probably not the most balanced view of the Revolutionary War, but coupled with a book representing the Rebel ideology, it would make a great addition to a lesson on early America. There is plenty of adventure and excitement to keep even reluctant history students hooked on the story, and the ending, though obvious from the title, still manages to surprise the reader with a few unexpected events.